Not just Metro Jay, but–leaping lesbians!–apparently a metrosexual funded by gay money because he voted to make marriage equality the law of the land. 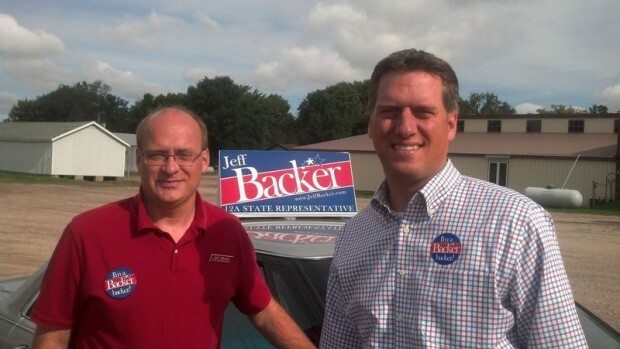 . . . . the widespread national network of liberal homosexual activists who have rewarded “metro” Jay McNamar with tens of thousands of dollars in campaign contributions for his vote for gay “marriage.” In fact, Metro Jay has received over $20,000 in contributions from similar homosexual activists across the country. Shortly after his accident, one of his teachers and a wrestling coach, Jay McNamer [sic] , encouraged Torrey to come out and try wrestling. Coach McNamer [sic] later learned the special rules for a blind wrestlers and kept encouraging Torrey to join the team. Yeah, that guy’s an uncaring tool of Outside Forces. However, we wonder about Backer’s fear of Outsiders and The Metro. Indeed, we have to wonder why such a fellow as Backer wants to go to St. Paul. But then, as we noted in several posts earlier this year, Backer had no problem what so ever padding his Facebook fans with folks from Bangkok and Istanbul. 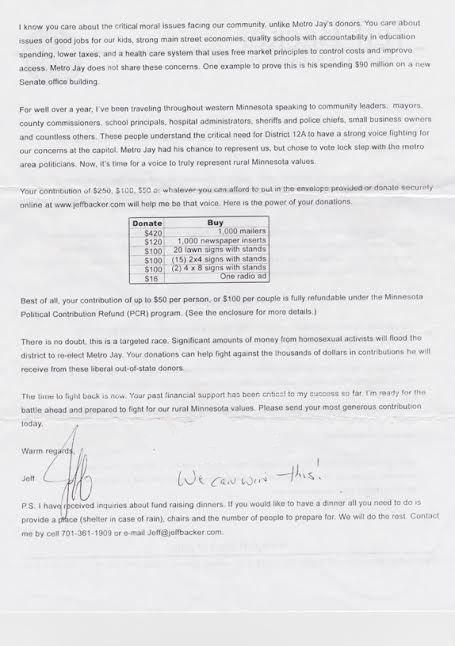 Photos: Anti-homosexual money candidate Jeff Backer and Minority leader Daudt , via Facebook(above); his anti-homosexual money fundraising letter (below). We redacted the first names of the people that were written above the “We can win this!” for their privacy.